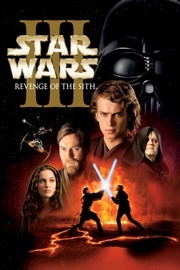 Star Wars: Episode III – Revenge of the Sith is a 2005 epic space opera film written and directed by George Lucas. It is the third installment of the Star Wars prequel trilogy.The film begins three years after the onset of the Clone Wars. The Jedi Knights are spread across the galaxy, leading a massive war against the Separatists. The Jedi Council dispatches Jedi Master Obi-Wan Kenobi to eliminate the notorious General Grievous, leader of the Separatist Army. Meanwhile, Jedi Knight Anakin Skywalker grows close to Palpatine, the Supreme Chancellor of the Galactic Republic and, unknown to the public, a Sith Lord. Their deepening friendship threatens the Jedi Order, the Republic, and Anakin himself.